Thank you so much for checking out Kitty’s Cats! There is a lot more to come and I can’t wait to introduce you to more characters and show you around Catzburg. Unfortunately, due to circumstances beyond my control, I need to find a new home. Apparently, selecting, purchasing, and moving into a new home takes a lot of time and energy. After a careful consideration, and consultation with the oracles, I have decided to put Kitty’s Cats on hiatus, rather than risk a compromise in quality or my sanity. I anticipate that it will take about three months to get this sorted out. When I am firmly situated, I will relaunch and post announcements to FaceBook, Twitter and my other social networks. Please make sure you have subscribed to one or more of my networks by using the links on the right side of the menubar. I will try to post updates on my progress to Facebook and this blog. There will be one final update before the full hiatus starts. I will be posting a color picture on Friday, January 18th. Please drop by! Finally, I would like to wish you all the best for 2013! 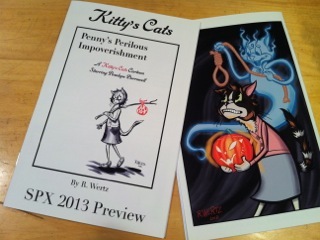 I am celebrating Halloween, and the launch of Kitty’s Cats, with a special full color illustration! Since the main story is in black and white, I will be doing supplemental color illustrations when I get a chance. Color prints will be available via my deviantART account, please buy them to support the comic! Check back soon for availability. Stop by Tuesday November 6th (after you vote!) for the first regular update. There will be new cartoons on Tuesdays and Fridays of every week, with possible exceptions for holidays. Update reminders will be posted on Facebook and Twitter. You can also subscribe to the handy RSS feed. I hope everyone has a positively horrifying Halloween! Be seeing you!